The National Institutes of Health Office of Rare Diseases (ORD) defines a rare or orphan disease as a disorder with a prevalence of fewer than 200,000 affected individuals within the United States whereas in Europe, rare diseases are defined as those disorders that affect 1 or fewer individuals per 2,000 persons. Several consortia exist for the compilation of rare lung disorders: the British orphan lung disease (BOLD) registry, the British pediatric orphan lung disease (BPOLD) registry, the French Groupe d’Etudes et de Recherche sur les Maladies Orphelines Pulmonaires (GERM”O”P”) database, and the Rare Lung Disease Consortium (RLDC) in the United States. The National Organization for Rare Diseases (http://www.raredisease.org) is a nongovernmental federation of organizations to assist individuals with rare diseases that seeks to expand recognition and treatment of individuals with these rare illnesses. 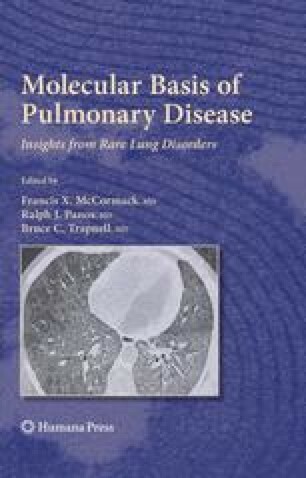 This chapter presents an approach to pulmonary medicine that aims to go beyond the usual respiratory disorders to examine the evaluation and understanding of rare lung diseases that have provided extraordinary insights into not only lung function in health and disease but also human biology in general. The respiratory history, physical examination, chest imaging, and related studies are reviewed. The emphasis of this chapter is the formulation of a differential diagnosis that encompasses rare noninfectious, nonmalignant lung diseases of adults and is based on the presence or absence of associated signs and symptoms. When you hear hoofbeats behind you, don’t expect to see a zebra. http://rarediseases.info.nih.gov/AboutUs aspx Accessed December, 2007.